CPrint Boards are an essential component of the CPrint program. Here you meet monthly with printers striving to apply the same CPrint principles as you. 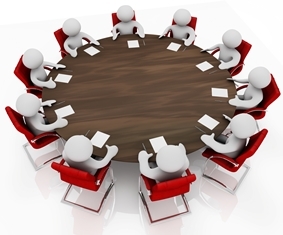 As a result, our board program is an opportunity to share ideas, concerns and triumphs. A CPrint professional facilitates the meeting. Short management training topics are also covered. CPrint boards are comprised of up to four other non-competing businesses similar to yours. We meet online monthly at a set time, thus minimize your time away from the shop. It also keeps your costs down, as there are no travel or meeting expenses involved. And, because we meet monthly, we’re always on top of your issues and your concerns. This means you don’t have to wait for six months to get meaningful feedback. Boards are particularly useful in sharing printing-specific problems and opportunities such as equipment, software or selling tips. Take-Aways: sharing among printers just like you who are applying the CPrint model to their business. Paybacks: a unique team of other printers like yourself and professional staff. That helps you with your challenges and opportunities. Delivery: online meeting, telephone and email support. 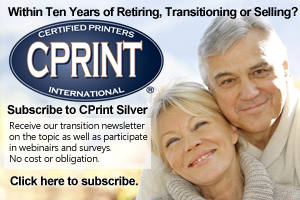 Commitment: Initial commitment for the CPrint program is six months with a 60 day advanced cancellation should you wish not to continue. Recommended For: any print shop owner wishing to meet with others but doesn’t want to share information with a competitor.